People used to believe that losing your teeth as you got older was a normal part of aging. Thankfully, that isn’t true anymore. We don’t need to look forward to losing our teeth, gumming our food and picking out dentures any longer. We can all do things to take good care of our teeth, so they last us a lifetime. Just because our baby teeth are going to fall out does not mean that they do not matter. At WDG Public Health we encourage parents to take good care of baby’s teeth and mouth by breastfeeding and by wiping the baby’s mouth with a soft, clean cloth after feedings. When baby’s first teeth arrive it is always time to celebrate! It is also time to start brushing with a soft bristle toothbrush. 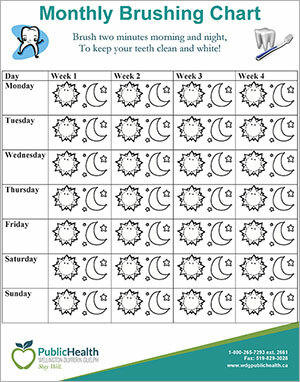 Here is a chart that shows when baby’s teeth usually arrive. We do not suggest the introduction of fluoridated toothpaste before age 3, unless recommended by a dental professional. Fluoride helps prevent cavities. A child’s first visit to the dentist should be at about age one. Today’s dentists work hard to make sure those visits are fun and not scary for little children. What we eat is very important in preventing cavities. Sugary foods and drinks, especially those that are sticky, provide fuel for the bacteria that cause cavities in kids and adults. Bottles of milk or juice taken to bed are very hard on children’s teeth and one of the big reasons little children can end up with cavities. Tooth decay in young children is a very serious problem. In Canada, up to 8% of preschool children have early childhood tooth decay and some of those children will need to go into hospital to get the holes in their teeth filled. Not only is it scary for kids and parents, it costs a lot of money. A Canadian government report in 2013 found that we spend about $21.2 million per year for dental work in hospitals for children age 1 to 5. In our community, we find that by grade two, 50% of children have had a cavity. Yet it’s almost entirely preventable. That’s why, as part of our regular visits to schools, our dental team teaches JK and SK students about the importance of brushing their teeth for two minutes twice a day – Two for Two. The kids get a tooth brush, a brushing chart, a two-minute timer and a letter to their parents. Click on the image below to print your own! April is Oral Health Month and this year we are encouraging parents to take care of their kids’ baby teeth. If you have questions about kids’ teeth or how to take the best care of them, feel free to give us a call at 1.800.265.7293. Our dental staff are here to help. If you, or someone you know, can’t afford to see a dentist, we can help with that too. So, take care of your teeth and your children’s, and keep your teeth for a lifetime!